Perfect for children's parties and functions, Sommersault's kids chair range features sturdy coloured plastic chairs suitable for indoor and outdoor use. These chairs have a durable polypropylene design, that is lightweight and stackable allowing for easy storage when not being used. 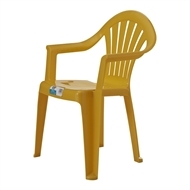 Compliment any children's party area with these fun coloured, kid size seats, ideal for musical chairs, pass the parcel and other children's games! Outdoor Living How to make a wooden DIY garden bench This wooden garden bench is easy to make and the perfect place to relax. Outdoor Living D.I.Y. bar stools With just a few pieces of dowel and some plywood, you can make your own D.I.Y. bar stools. Outdoor Living How to protect outdoor furniture The winter rain and summer sun can take its toll on your outdoor furniture. But there are some simple things you can do to keep it looking good and last longer. Outdoor Living D.I.Y. outdoor table with built-in drinks cooler Learn how easy it is to make an outdoor table with a built-in drinks cooler that can become the focal point for all your get-togethers. Learn more here. Outdoor Living D.I.Y. hammock stand This D.I.Y. hammock stand is easy to make yourself and a great way to soak up the sun or curl up with a good book. Outdoor Living How to design your outdoor room Make the most of your living and entertaining areas by creating an outdoor living room to enjoy with your family. Outdoor Living D.I.Y. outdoor daybed This outdoor daybed will help you to relax and unwind while you’re outside; it’s also a great design feature.